Ten large builders build more than 20 percent of all homes in the United States. And those builders are changing the way land is developed, relying increasingly on planned unit development and master-planned communities that differ significantly from the first generation of PUDs. This report from APA's Planning Advisory Service will help you revise your ordinance to deal with the new generation of PUDs. 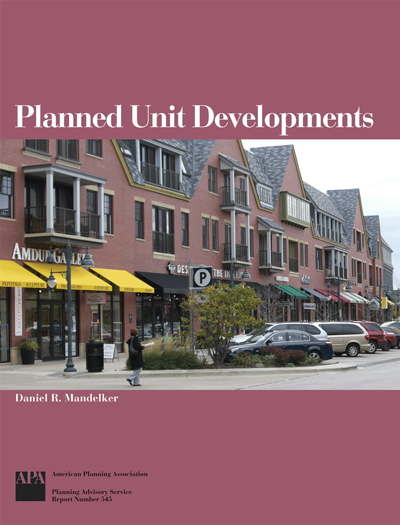 Written by Daniel Mandelker, with contributions from Dwight Merriam, David Callies, and others, it provides recommendations on how PUD ordinances can be drafted, with examples from communities around the country. It also includes a review of case law and state statutes. Development As-Of-Right or by Review? One Type of PUD or Many? How Should the Zoning Be Done? Overlay District or New Base District?